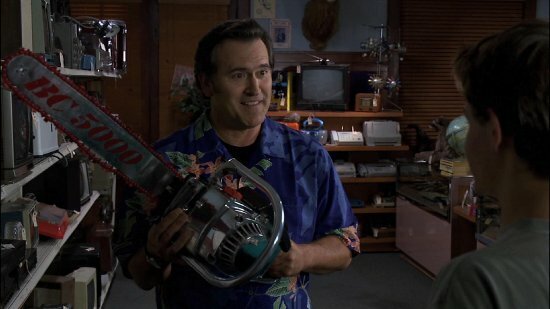 Bruce Campbell isn't so much an actor as an icon. The very definition of a jobbing actor - he'll star in just about anything if it pays - he has a cult following not just because of his legendary performances as Ash in the Evil Dead films and Elvis in Bubba Ho-Tep but because of his many ridiculous and terrible films. My Name Is Bruce is a love letter to this following - a film in the same spirit as those that made him famous. 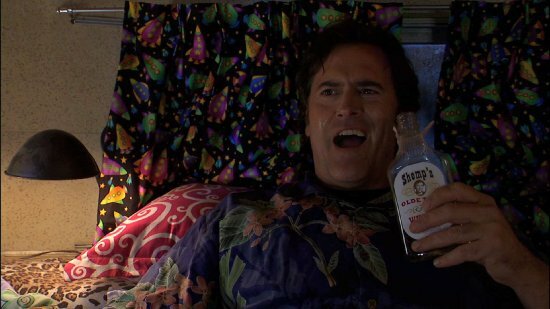 Bruce Campbell plays Bruce Campbell, a terrible action actor currently working on Cavealien 2 who abuses his fans, drinks heavily, subscribes to a variety of pornographic magazines and drunk dials his ex-wife Cheryl (Ellen Sandweiss, Cheryl from The Evil Dead). In Gold Lick, Oregon, two kids hoping for some action go to a Chinese graveyard with some girls, they kick over some headstones and one removes an amulet from a boarded up mine entrance accidentally awakening Guan-Di, the Chinese protector of the dead, god of war and bean curd. Guan-Di is handy with his halberd and quickly beheads three of the teens, leaving Jeff, a massive Bruce Campbell fan, to escape. Jeff thinks that the only person who can deal with demons is Bruce Campbell so drives to his trailer and asks for his help but, when the drunken actor is less than helpful, he kidnaps him and takes him to Gold Lick. Mistaking his welcome for a birthday present arranged by his useless agent (Ted Raimi), Bruce thinks the whole thing is a setup and, partly because he's infatuated with Jeff's mother, he agrees to lead the assault on Guan-Di. When he find out the Chinese God isn't a guy in a rubber suit, he high tails it back to his trailer but when Jeff calls to tell him that he's going to take on Guan-Di alone, Bruce's conscience gets the better of his common sense and he heads back to Gold Lick. Whilst not the sort of title that demands high definition, My Name Is Bruce looks good with a very good transfer with bright colours, good black levels and clarity. However, the film was shot on HD and there are the occasional compression artefacts associated with HD filming, but mostly in the background and not detracting from the overall picture. For a low budget movie the special effects makeup is very convincing, as is the work done to bring Guan-Di to life. With a choice of DTS-HD Master Audio or Dolby Digital 5.1, obviously the lossless track comes out on top, but the 'normal' surround mix is impressive. Both make good use of the surrounds and have clear dialogue. Feature Commentary with Bruce Campbell and Mike Richardson - funny and informative, not as good as the Evil Dead tracks, but then there's no Sam Raimi for Campbell to antagonise. Both manage to cover the shoot at all levels of production whilst being amusing and fun to listen to. Heart of Dorkness - filmed during the shoot, this hour-long featurette is an excellent piece, covering everything from conception to casting and everything that took place during the 18 day shoot. It's a great riff on Eleanor Coppola's documentary about Apocalypse Now and one of the better 'making of's I've seen in a while. Awkward Moments with Kif - a two minute piece with associate producer and 'Bowling Shemp' Craig 'Kif' Sanborn which isn't particularly funny or enlightening. On the other hand, Bruce on... is several musings on life by Bruce Campbell which is amusing due to his dry wit. There are several other short set related pieces like The Hard Truth and Lovebirds which are brief and reasonably entertaining. There are a couple of pieces about Cavealien 2: a fake making of and the trailer which are worth a watch but nothing spectacular. There are three galleries, poster art, props art and photos which range from on set photos to the great poster mashups shown on TV during the film. Finally there is the Theatrical trailer and some easy to find Easter Eggs. As I said in the introduction, this is basically a 'thank you' to Bruce Campbell's loyal fans who'll watch him in any film, no matter how bad and is made as a low budget send-up of all the crap he's appeared in over the years. It's wonderfully written with some great lines that you'll be laughing at long after the credits have rolled and will enjoy during repeated viewings. 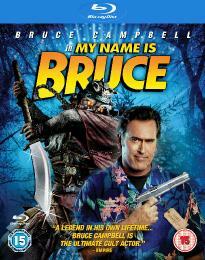 There will be a direct correlation between how much you like Bruce Campbell films and how much you'll enjoy this. Über fans of Campbell's material will lap up all the in jokes, whereas those who have never seen him in anything else will be left completely cold. I'm somewhere in the middle, not having seen every film in which he has appeared, but thought this was terrific. 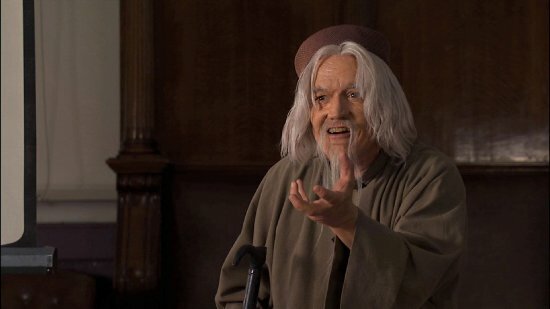 Some of the nods are obvious like the 'Shemps' Whiskey that he drinks and Ted Raimi in three roles, the best of which is the old Chinese graveyard keeper - there are even 'Shemps' in the credits. Campbell's screen presence is the key, with his larger than life persona reflected in the Hawaiian shirt and outrageous behaviour. It's far from a great film, but there's plenty to like and I'll probably watch it many, many more times, probably acquiring more Bruce Campbell films as I go. It's a good package and, as it retails for only a little more than the DVD, this is well worth picking up. too much time on your hands Whoot? nah.. Dave seems to watch ALL the fims that pop up on my radar..
but then I do seem to go for the low rent cult end of the spectrum. I always read and never comment, just wanted to show some appreciation.